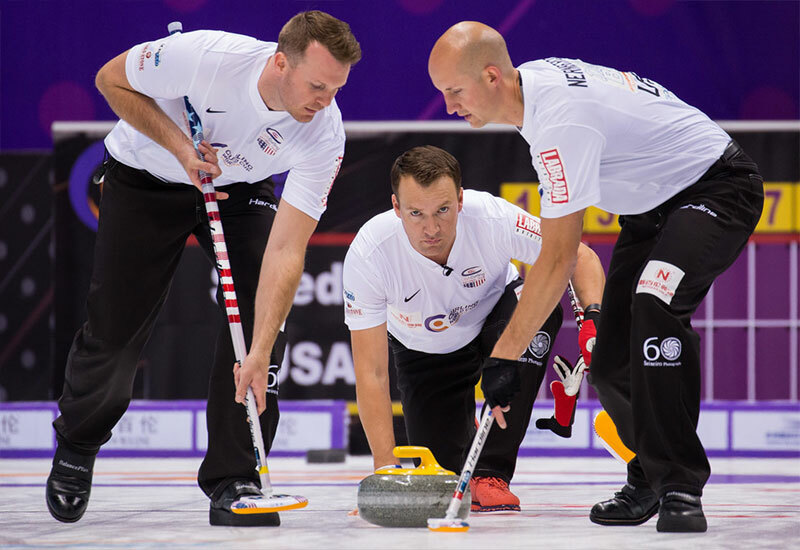 By Price Atkinson - What a day for USA Curling and its three teams on the opening day of competition at the inaugural Curling World Cup in Suzhou, China. All three teams (men, women, mixed doubles) scored victories in their opening round-robin games to get Team USA off to a great start. Coming off an incredible and banner season last year, the American teams seemed to carry that momentum into the first of four legs in the newly created Curling World Cup. USA Curling joined Canada's Rachel Homan, Kevin Koe and Mixed Doubles pair Laura Walker/Kirk Muyres as the only other country to win in all three events on the opening draw. Led by Olympic skip Nina Roth, her foursome along with Aileen Geving, Becca Hamilton and Tabitha Peterson scored an 8-6 comeback win over Team Kim from Korea. Alternating deuces in the first-three ends, the Koreans stole a point in the fourth for a 5-2 advantage. Then the rally began for the Americans. Roth grabbed a deuce in the fifth and forced the Koreans to just one in the sixth. Trailing 6-4 in the seventh, Roth netted a triple and then stole one in the eighth and final end for the win. Homan defeated Russia's Anna Sidorova, needing to score two in the last end to win 6-5 after overcoming steals in the first two ends. Fresh off a bronze medal finish at the Audi Quattro Winter Games in New Zealand, the U.S. mixed doubles duo of Korey Dropkin and Sarah Anderson immediately pounced on their Korean counterparts from the start. Playing in Group B, the Americans put up four in the first end and stole another two in the second end. Team Korea got their only point in the third end before Dropkin and Anderson slammed the door shut with a point in the fourth and steals of one and two in the fifth and sixth ends. Canada's Walker/Muyres opened an early lead on Norway and cruised to a 9-5 win in their Mixed Doubles game. Kevin Koe with his new squad of BJ Neufeld, Colton Flasch and Ben Hebert took on Switzerland's Peter De Cruz to in the opening round men's action. Koe blew the game open with 3 in the sixth end en-route to a 6-4 win. The reigning U.S. national champion Team Persinger faced their stiffest test competition in Pool A right out of the gate, taking on the defending world champion led by skip Niklas Edin. Team Edin grabbed an early one-point lead after the second and fourth ends inside the Suzhou Olympic Sports Centre. Drawing for one in fifth, fourth Greg Persinger?s stone came up short of the four foot and the Swedes got a big steal for their largest lead of the game. But that advantage quickly evaporated in the sixth with Team Persinger's first and only deuce of the game, notting things up at 3-3. Playing with lead Kroy Nernberger and second Sean Beighton in place of Phil Tilker and Colin Hufman who couldn't make the trip due to work commitments, Team USA applied more pressure in the seventh with a steal of one and their first lead of the game. Persinger delivered an absolute pistol on his final stone in the eighth, an angle double raise that forced Edin to make one of his on the Swedes' last rock of the game. However, Edin?s shot for two and the win just barely missed and gave Team Persinger a huge win in their Pool A opener. "That is a big win for us," Persinger said afterwards. "All these teams are going to be tough for us, but obviously they're the toughest team in our pool as far as rankings are concerned."